Suzie Aries is nothing if not a fighter – living proof, if any were needed, that cancer does not have to signal the end of your hopes and ambitions – and finishing her sell-out concert at The Pheasantry in London’s King’s Road last Sunday (3rd September) with Elton John’s I’m Still Standing felt like the perfect way to sum up an inspiring, joyous, energetic and yes, loving, testament to her stunningly prodigious gift as a singer and actress. Do I sound a mite overenthusiastic? Yes, probably, but this occasion justifies – nay, demands – overenthusiasm. From the first song, Mad Hatter from the musical Wonderland, to the final squeezed-in-after-Elton-John encore (Ed Sheeran’s Castle On The Hill), Miss Aries held the audience spellbound with her artistry, virtuosity, and personality. Supported by a tightly professional band of piano, bass and percussion, the first act was devoted to musical theatre, and featured generous helpings of Jason Robert Brown (Summer in Ohio, Stars and Moon, and I Give It All To You), other contemporary musical theatre writing (songs from Avenue Q, Seussical, and In The Heights), a splash of traditional (As Long As He Needs Me) and the very naughty A Simple Valley Song (from Cleary and Brunger’s Jet Set Go), before which Suzie, with a cheeky wink, apologised to her grandad in the audience, given its explicit language and descriptions of various hilarious – not to mention risque – exploits. An especial highlight was the performance of I Wish I May from The Witches of Eastwick, in which Suzie was joined by two of her guests for the evening, Becca Hoodless and Gina Robinson, this was beautiful, poised, perfectly blended harmony singing which justifiably merited thunderous applause. And even Disney got a look in, with a spirited rendition of Let It Go to please any Frozen fans in the audience. Changing from red party dress into more informal attire (including the removal of the wig – bringing home that Suzie has recently finished chemotherapy) the second act was a selection of pop songs of marvellous variety and quality, kicking off with some original material from her band, Authentic Blue. Joined on stage by fellow band members Tim Thomas, Amie Clapson and Nic Chiappetta, we were treated to three numbers: Take It On The Chin, I Love Too Much, and the gloriously witty Baby Hunger. As with act one, the songs chosen demonstrated Suzie’s innate instinct for what goes down well with the audience and also her own incredible versatility. Songs by Frankie Valli, Adele, Ed Sheeran and Guns ‘n’ Roses were perfectly judged, but most moving of all was the performance of Eric Clapton’s Tears In Heaven, presented with simple guitar accompaniment from Brian Raftery taking a few moments’ break from playing the piano. 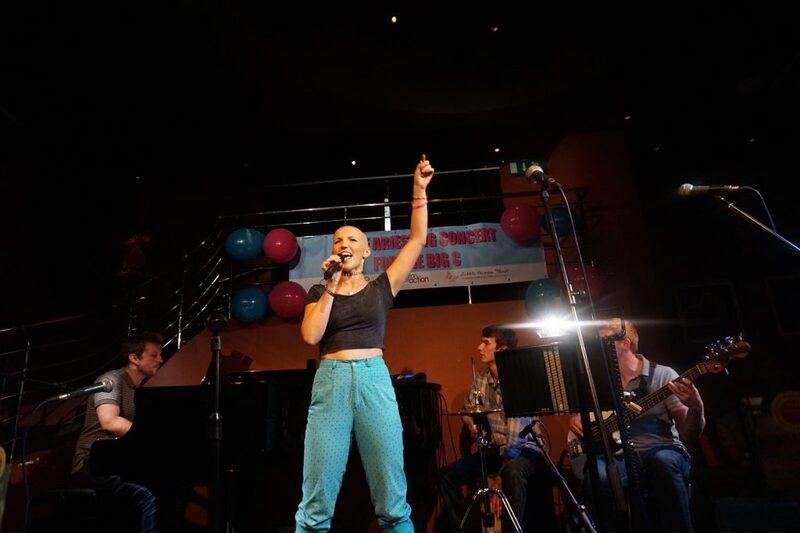 All proceeds from the concert are to be divided between the ovarian cancer charity, Ovacome, and the Little Princess Charity, and more than £1000 was raised from ticket sales and donations on the night.